﻿ Who are 'We' at Green Hill Hostas? Born and raised in Miami, Florida, Bob Solberg grew palm trees from seed in his small backyard nursery as a kid and cruised Biscayne Bay in his small sailboat. He attended Davidson College in Davidson, North Carolina and graduated with a B.S. in Biology and then studied bryophyte ecology for three years at the University of North Carolina. Like so many UNC students he decided to stay permanently in "Blue Heaven". In 1981, after experimenting with azaleas and rhododendrons, Bob chose to specialize in hostas in his new backyard nursery endeavor. 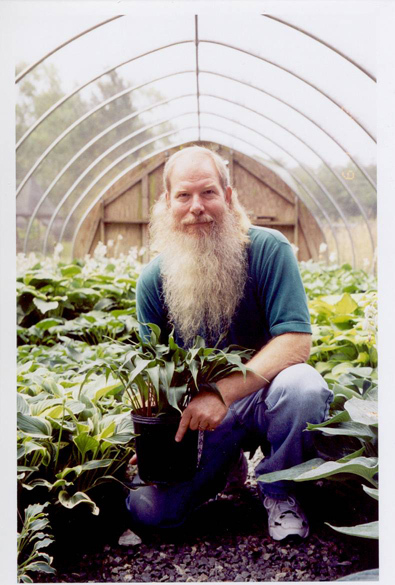 He became founder and head of the Carolina Hosta Society in 1986 which hosted the 1991 American Hosta Society National Convention and again in 2001. He has served in many positions in that organization up until the present. In 1992 Green Hill Farm outgrew the backyard and moved to its current location. 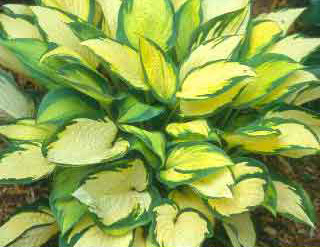 It is now a wholesale and retail nursery introducing new hostas into the trade. From its hosta hybridizing program, new hostas are shipped nationally and internationally to nurseries, hosta clubs, and hosta collectors throughout the year. 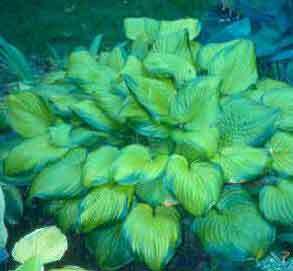 Bob has introduced more than 50 hostas to date and has plans to add five or so to that number each year. 'Guacamole', introduced in 1994 and Hosta of the Year in 2002 is probably his best known cultivar and is probably in your garden. 'Orange Marmalade' PP#16,742 is his first patented hosta and destined for a wide distribution. ‘Corkscrew’, ‘Ginsu Knife’, ‘Baby Blue Eyes’, 'Coconut Custard’, ‘Cracker Crumbs’, ‘Barbara May’, and ‘One man’s Treasure’ are some of his better introductions. Bob has been very active in the American Hosta Society, serving as the Editor of The Hosta Journal, the principle publication of the American Hosta Society, (1988-1990) and Vice President for The Genus Hosta, (1998-2001). He was the recipient of the 2003 Alex J. Summers Distinguished Merit Award. Bob is currently co-founder and Executive Secretary of The American Hosta Growers Association, (1998-present), a professional trade organization for hosta nurseries. The members of the AHGA select the Hosta of the Year annually. Bob is a nationally known lecturer on the subject of hostas and writer of many articles on hostas. He has edited the "Green Hill Gossip" for the past 13 years and the "Gossip Jr.", a twice yearly subscription newsletter since 2004. When the hostas are up and glowing in the garden you may find him on the road, bringing hostas and hosta stories to a town near you.